Here are some facts about Iron Age hill forts (sometimes referred to as hillforts) in Britain. A hill fort, essentially a defended enclosure, was an elevated site with ramparts (defensive walls) made from earth, wood or stone, and a ditch dug along the site’s perimeter. The walls and ditches commonly followed the natural contours of the hill upon which the settlement was constructed. 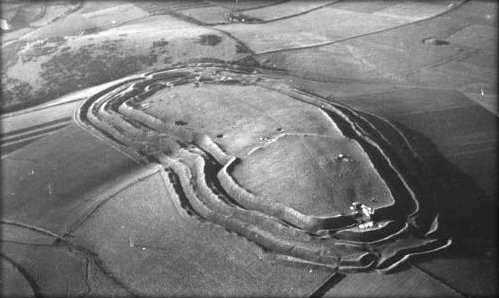 Many historians and archaeologists believe that the term ‘hill fort’ is misleading. It makes us think of castles and warfare, when we should be thinking in terms of ‘enclosed places’ built for a variety of purposes. Although some hill forts were probably built with defense in mind, they may also have had ceremonial functions, and served as status symbols. Although some hill forts were built in the Bronze Age, the Iron Age saw a massive rise in hill fort construction. More than 3000 Iron Age hillfort-like structures have be located in Britain. Some of the largest hill forts had an areas of more than 30 acres within their defensive walls. When southern-Britain became part of the Roman Empire, many hill forts seem to have been abandoned. However, in areas of Britain largely untouched by Roman rule – Wales, the West Country and Scotland – hill forts were used into the Early Medieval period. Some well-known hill forts in Britain, include: Mam Tor (Derbyshire), Maiden Castle (Dorset), Crickley Hill Fort (Gloucestershire), Danebury Ring (Hamphsire), Beacon Hill Fort (Herefordshire), Warham Camp (Norfolk), Uffington Castle (Oxfordshire), South Cadbury Hill Fort (Somerset), Figsbury Ring (Wiltshire), Bredon Hill (Worcestershire), Anglesey (Wales). In Wales, some forts were re-occupied during the Roman period. Sometimes the Romans took a violent objection. Sometimes the Romans let-be. Perhaps it depended on whether the Welsh (called Britons at that time) were about to cause trouble or not.